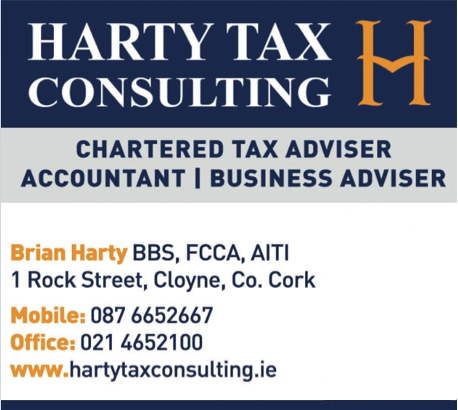 East Cork AC are delighted to be teaming up with Harty Tax Consulting as club website sponsor for 2018. Harty Tax Consulting are dedicated to providing high quality financial information and services to their clients. Services are tailored to meet the needs of both commercial buinesses and private individuals throughout the whole of Ireland and beyond. Specialist tax advice to other professionals including accountants and solicitors, and their clients. Specialist Tax Advice, Tax Returns, Year End Accounts, Company Formations, Payroll, VAT Returns, Cash Flow Projections, Business Advisory, Bookkeeping, Tax Advice on Property Transactions, International Tax, Retirement & Succession Planning, Grant Applications and Trust & Estate Tax.